I took this shot during the first day of my visit in Istanbul, Turkey. photographed I only managed to take just a few shots that first day. Nice shot.Looks like the guy there is a little worried himself. Very good shot. Thy flying rats would be proud of this work. Very nice shot. 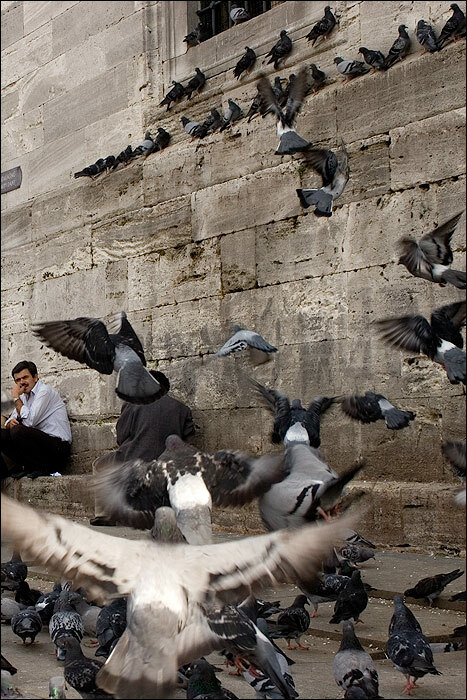 It transmits what you feel when surrounded by pigeons. Fantastic capture – I would be freaking out if I were stuck in the middle of that lot! Feels like haveing been taken on a sunday afternoon. Right? Good snapshot with these flying birds “frozen in action”. Oh I love this. The angle is wicked cool. Is the guy sitting there afraid of pigeons !?? Brilliant shot! That man’s inquisitive look towards the camera makes it all the more moment-capturing! Unbelievable how many pigeons there are in this picture. It’s really awesome. Great job! The best part of this amazing shot is the brown bird in the foreground with it’s wing outspread. Great capture on that. I love it. I can imagine how the pigeons behaved when they saw you. Super shot. Like the mellow colours. Wow…took my breath away. Especially the bird in the foreground. im moving their soon and cant wait to get a feel for it.